OMG I can't actually believe I've been chosen as one of the finalists! I am genuinely honoured. It's so great to know not only my blogging efforts but other wonderful bloggers are being recognised for their hard work, creativity and originality in the blog world. Well done to the other bloggers who have been chosen as finalists! "Haynet is full of great blogging talent, but not all fit neatly into the equestrian category, so to reflect the diversity of bloggers in general and keep true to our core values, we were keen to open up another hugely popular subject matter through a brand new award." Voting is NOW OPEN and I have until midnight on Friday 19th May 2017 to receive as many votes as I can. Whilst the judges still hold 50% of the vote, the remaining 50% is up to the public. This is where I need your help. It only takes 30 seconds and would mean the world to me. Click the link above, pop your email address in the box, find my blog name (Charlotte in England) and submit. That's it!
" 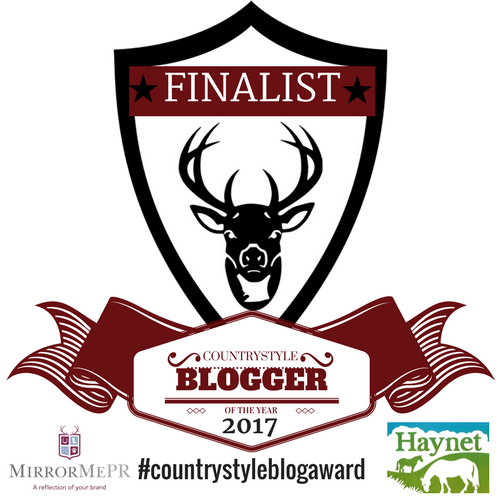 Equestrian & Country Blog Portal Haynet & Equestrian, Canine, Country PR & Digital Marketing Agency MirrorMePR has announced the finalists for a brand new award, the ‘Country Style Blogger of the Year’. “The ‘Equestrian Blogger of the Year’ Awards we created five years ago has continued to grow in popularity, and now we felt that we needed to recognise those bloggers writing about their country style interests." “We’ve both thoroughly enjoyed researching and reading so many great blogs. It was tough for Samantha and me to narrow them all down to just six, but we are both thrilled to present the following blogs for shared final public judging.” "
I personally want to thank YOU (yes, I mean you!) so much for your continued support! The winner will be announced on Wednesday 24th May 2017 at www.hay-net.co.uk.